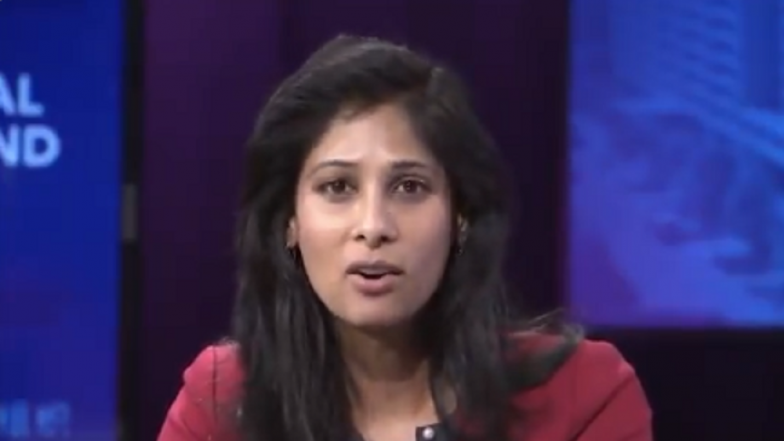 Mumbai, April 11: While lauding India’s GDP rate, Gita Gopinath, Chief Economist of the International Monetary Fund, has also cautioned there are certain issues in the manner in which numbers are being tabulated which has been conveyed to New Delhi. “There were important revisions that were made in 2015 as a part of modernising India's national accounts statistics, so that is certainly welcome. That said there are still some issues that need to be fixed and this we have flagged before with respect to the deflator that is being used for estimating real GDP, this is something we have flagged in the past.” Gopinath said while speaking to business news channel CNBC. She explained, "GDP deflator is a measure of inflation which captures the rise in GDP due to higher prices rather than an increase in output." The IMF Chief economist said that India’s growth rate is one of the highest in the world means that everyone is paying attention to it but that also means that data coming out has to be credible. She said, “India is projected to be growing over 7 percent both in 2019 and 2020 which makes it one of the fastest growing large economies of the world, which is why it is even more important that the statistics coming out of India are transparently communicated because everybody is watching India at this point”. Gopinath’s comments on India’s GDP calculations come after the IMF revised down the global GDP forecast for 2019 to 3.3 per cent from the previous level of 3.5 per cent in its latest World Economic Outlook (WEO). Gopinath while speaking at a separate press conference said, "This is a delicate moment". The WEO underlined that 3.3 per cent expansion is "still reasonable", but warned the outlook is still "challenging for several countries owing to possible flaring up of trade tensions." “It's very important that policymakers do no harm and work cooperatively," Gopinath said. The WEO revision of the growth projections comes after the WTO too revised global trade numbers downward.